1 Caption: René Levesque, 23rd Premier of Canada, worked as a war correspondent for the CBC during the Korean War. 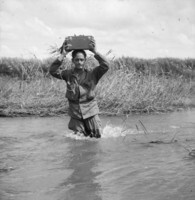 In this picture, he puts his mini-tape recorder on his head and fords a small stream as he works his way forward to RCR troops deeper in enemy territory in Korea. 2 Once the U.N. forces were again facing a possible victory, they stopped pushing. As soon as the Chinese were pushed north of the 38th parallel, heated debate set in on what to do next. Some wanted a complete military victory, while others wanted to negotiate for peace. General MacArthur lost his job over it when he disagreed with the U.N. and Truman's goal of negotiated peace. 3 The Chinese were not willing to give up. They were able to rebuild their troops for a counteroffensive. The Chinese struck at a Commonwealth Brigade position along the Kapyong River. 4 The troops were trying to keep open the retreat for soldiers and were under attack themselves starting on April 23, 1951. For a short time the supply line was cut off. The Canadians continued to fight and called for supplies to be air dropped. 5 The Princess Patricia's Canadian Light Infantry were recognized for their valor. They held their position and inflicted heavy enemy damage with few casualties of their own. 6 In February 1951, it was decided to send the rest of the promised Canadians in. The 25th Canadian Infantry Brigade landed in Korea in May. They were just in time to help the third march to the 38th parallel. 7 The Canadians served with the 25th U.S. Infantry Division. They were part of an advance force that would seize and hold an objective until the main force could arrive to take it over. By May 28, they moved north of the 38th parallel. 8 Most of the large hills were designated by numbers. The battles at Kakhul-bong and Chorwon Plain centered around those hills. Canadian positions had to patrol constantly to keep the enemy from sneaking up on them. 9 Cease-fire negotiations began during the summer of 1951. The talks dragged on for two years. During the summer, the Canadians were held in reserve, and they helped with patrols to protect the supply line through Chorwon to Seoul.